It’s about time that I posted about Cordon Bleu, seeing that it commenced my culinary journey during my gap year. I have pictures of pastries I learned how to make that I haven’t posted anywhere (and after last year’s stolen phone fiasco, I am always worried about losing un-posted photos). Plus, after getting some fresh yeast from a bread-making friend of mine, I thought it was about time that I made croissants. This was one of the most exciting recipes to learn during basic pastry. My experience at Le Cordon Bleu Ottawa was extraordinary – I met a lot of wonderful people, learned how to make many recipes, practiced French pastry techniques, and dealt with a few administrative frustrations, but left feeling accomplished, yet sad not to join my classmates in intermediate pastry. As much as I desired to proceed to the next level, I wanted to gain experience at a bakery, and save for my trip to Argentina. The best part about basic pastry was probably Chef Jocelyn – he has such a quirky personality and had the class constantly in giggles, which made for an easy and fun learning environment (not that what we were learning was easy). Pretty much all the chefs are from France, and it takes a while to get used to their accent and funny cursive writing. I also really enjoyed the wine and cheese tour to Prince Edward County, the free lunch with my classmates at the Signatures restaurant, and the pleasantly awkward yet sentimental graduation ceremony at the end. Most importantly, I learned how much I love pastry, and that no matter what I choose to be in life, I will always be a baker. So, making croissants is a two-day event, but does not take that much effort – it’s the waiting time that makes it so long. Cordon Bleu uses grams in their recipes, so a scale is needed. 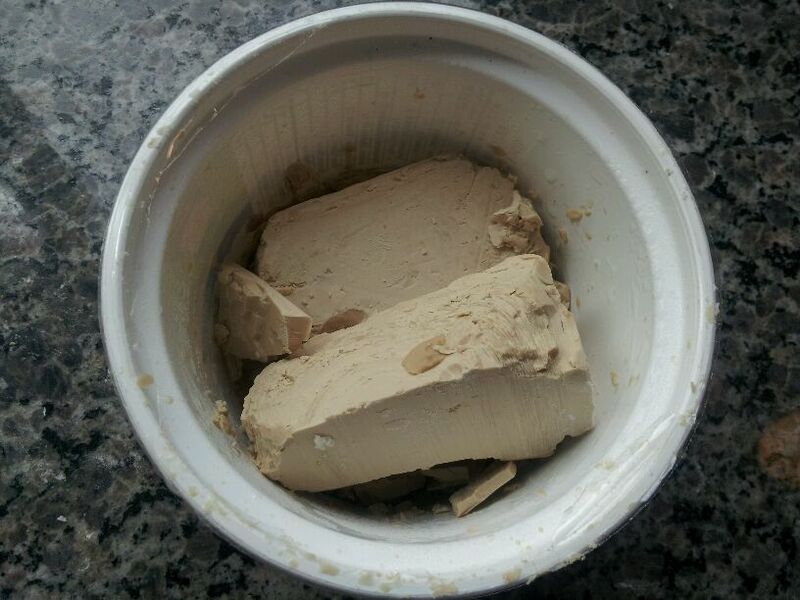 Note that you should never substitute the same amount of active dry yeast for fresh yeast. I sifted the flour on the counter and made a well in the centre, then placed the sugar in the middle, the salt on one side, and the yeast on the other (this is important to avoid killing the yeast). I mixed them together, using my fingers as a whisk. I then added the milk little by little, incorporating it into the flour mixture, and then added the water until the mixture formed a ball of dough – it was a little sticky, but this is normal. I did not need to use all the water, though. I kneaded the dough for ten minutes; this involves throwing the dough on the counter, keeping a grip on part of the dough, then folding the dough over on itself and grabbing it from the side. I repeated this motion until the dough was not sticky anymore. 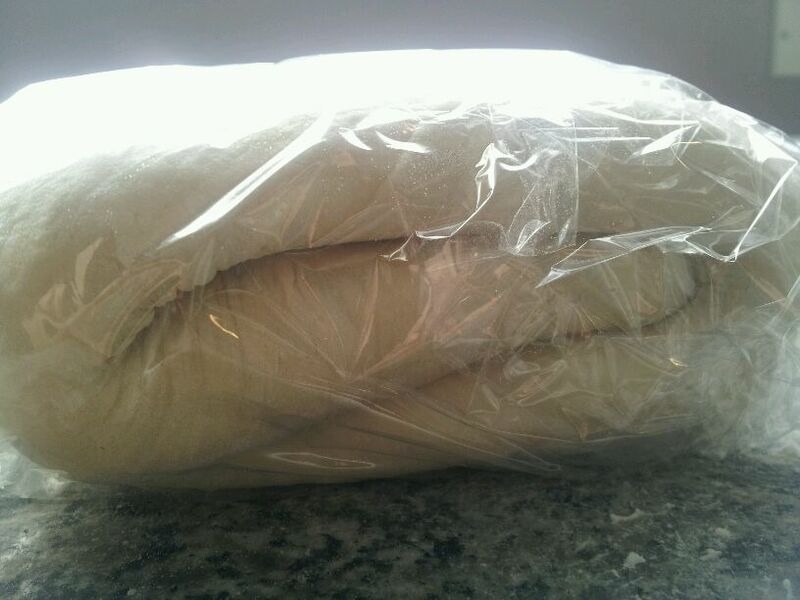 Then, I let it sit for an hour and a half at room temperature, inside a bowl and covered with a cloth. I took 250g butter, placed it between two sheets of plastic wrap, and used a rolling pin to bang it into a square, about 12cm by 12cm. I rolled out the dough to be square and slightly larger than the butter, placed the butter in a diamond shape on the square dough, folded the corners over the butter to wrap it up like a package, and sealed the dough shut. There should be no visible butter. 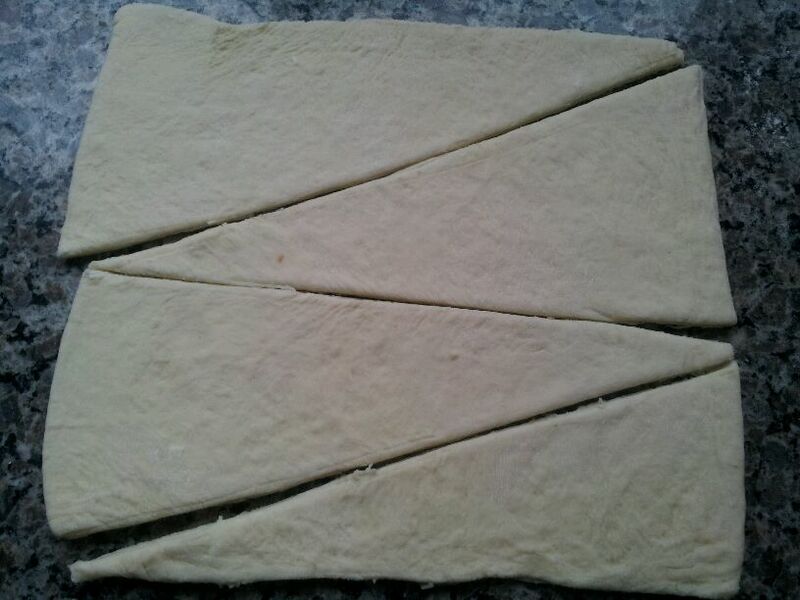 I rolled out the dough to be 3 times as long as it was as a square, then folded the top part down 1/3, and then the bottom part on top of it to make the dough into a square shape again (it is important to brush off all excess flour as you fold). Then, I made a quarter turn and repeated the rolling and folding. Then, I put plastic wrap all around the dough and put it in the fridge overnight (or as chef would say, “plastic wrap and fridge!”). 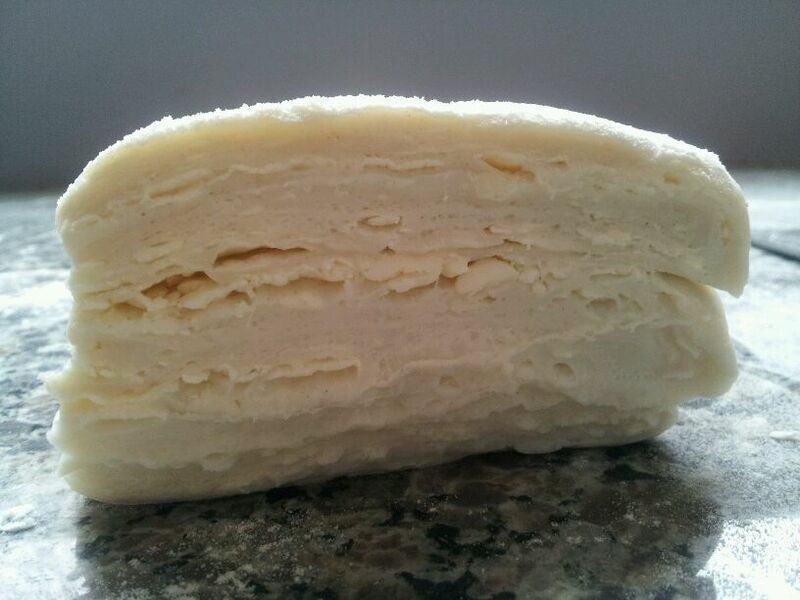 The next day, I made two more turns with the dough (by rolling it out and folding the top part down, then the bottom part over the fold, the same way I had done before) and then refrigerated it for another 20 minutes. I cut the dough in quarters, then rolled out each section, keeping about 5mm thickness, and cut off the edges. Also note that the unrolled pieces of dough should be kept in the fridge. 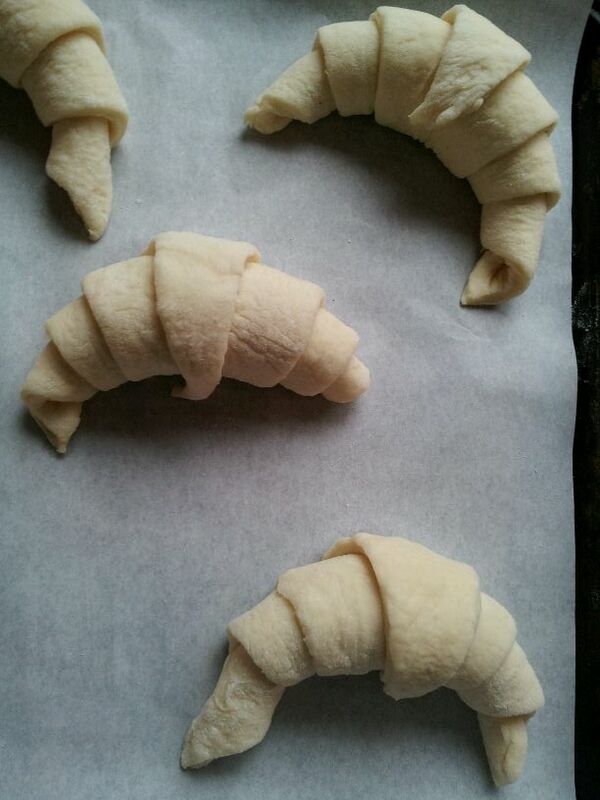 For the croissants, I cut long triangles about 12cm length by 25cm height, and rolled them from the smallest edge to the tip of the triangle, then made a crescent shape. 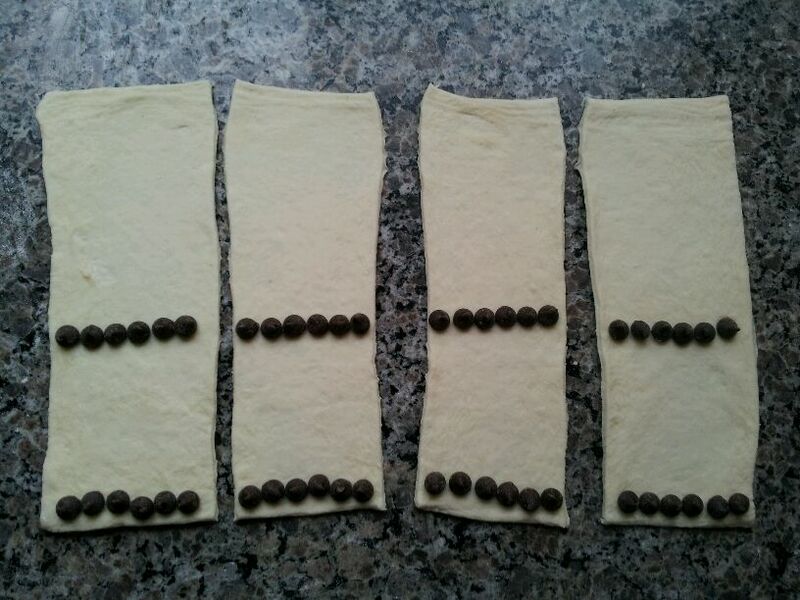 For the pain au chocolate, I cut long rectangles, then assembled chocolate chips in a line at the base of the rectangle, and another line in the middle of the rectangle (at Cordon Bleu we used a special kind of chocolate that came in a small log shape, but I had chocolate chips on hand). 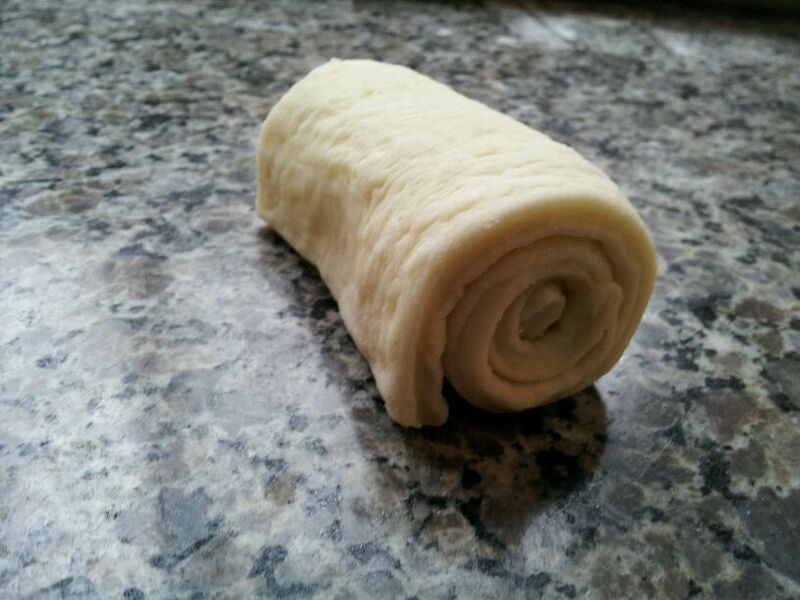 I rolled up the dough, starting by the row of chocolate closest to the edge. The pain au chocolate should rest on the pan like this, with the lip of dough facing down. I left the dough for 40 minutes, resting on parchment paper on top of a cookie sheet. The tops of each piece must be brushed with a beaten egg, but silly me – I didn’t have any eggs – so I used milk (I hear all the French pastry chefs in the world gasping. I’m sorry!). Then, I baked everything at 350 degrees Fahrenheit until they are very golden brown. It is important not to under-bake them, as this can make the eater sick. At Cordon Bleu they never told us how long our product would take to bake; chef would always say to bake it “until it is done”. While this makes sense, it was definitely a learning experience to keep a close eye on the product, and know exactly what it should look like when it is finished. 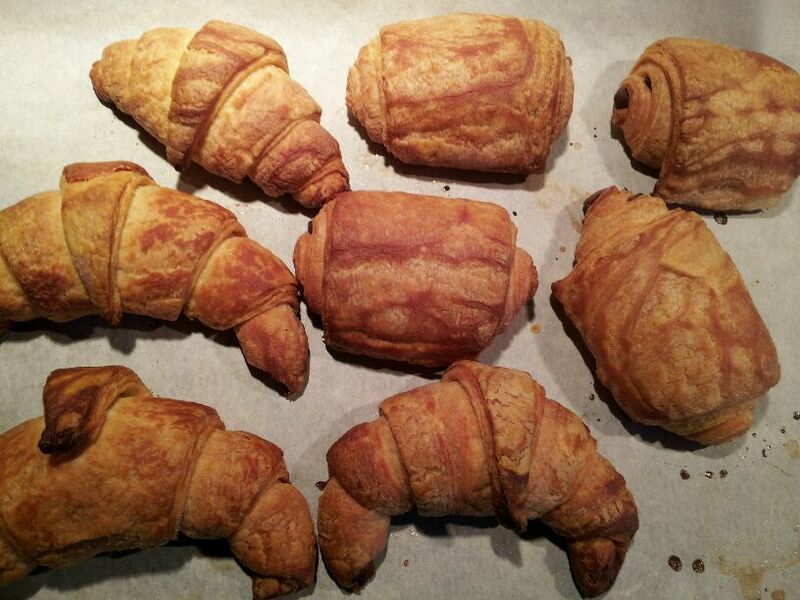 These croissants took about 35 minutes – I admit they would have looked a little better with an egg wash.
I’ll never forget the excitement I felt the moment I first took a bite of a croissant that I made myself. Here’s to an unforgettable experience at Cordon Bleu – a huge check mark off my life bucket list. Mmmmm. Croissants and lemon tart are my favourites! Hi Bri, thanks for the comment! At Cordon Bleu they used T-45 white flour, but you can just use all-purpose white flour.